The house looks like some sad, old bag lady with a purloined tiara but at least we've done something about our energy use. I'm not entirely sure when we offset the energy used to manufacture the panels, etc. but at the moment we're adding renewal energy to the electrical grid. 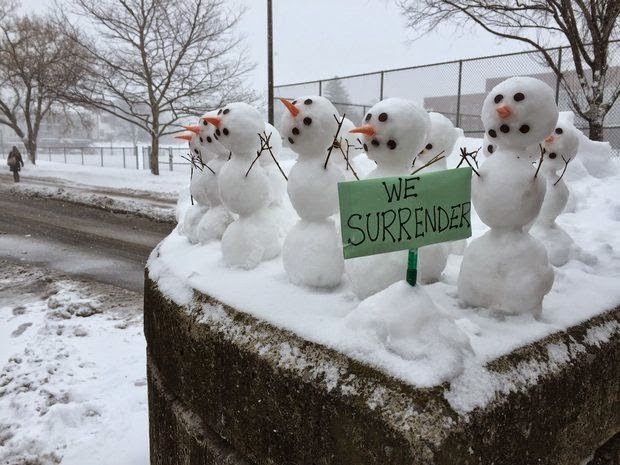 Snowmen made by a clever parking booth attendant up at SU. The airport recorded a record low of -17º early this morning while the reading from the cottage was -11º. It seems we continue to be one of the few islands on the globe with temperatures below, rather than above average. I bundled up yesterday and ventured out. I took care of the birds and realized the conditions weren't nearly as bad as I expected. I still wasn't sure how much exertion I should extend in the cold so I pushed some of the snow to the periphery. It also took considerably more effort to lift the snow with the extra layers of clothing I was wearing. In the end I was sweating and more worried about heat prostration than getting chilled! They seem to take a surprisingly long time to ripen but they are delicious and plentiful! I couldn't find a photo of a munk eating an immature, green tomato, probably because no one would expect to see it. I couldn't believe it myself yesterday when I found a half-eaten tomato in the garden. I noticed two missing on the plants, one Stupice and one Rutgers, and I found the second under the lovage. At least I think I trapped the culprit late yesterday and took it over to the owls at Green Lakes. There's no sign of predation this morning and the eggplant I set out yesterday look lovely. The usual #1 garden enemy, the deer, have been oddly absent in recent weeks and the one groundhog we saw briefly seems to have moved on. Still I'm keeping the possibility of a screened garden in mind. May, 14: by far the earliest date on which I have set out tomatoes. They're only four cherry tomato plants set out in pots but they're planted where they're meant to grow: two different red varieties (Gardener's Sweetheart, a grape, and Fox Cherry) and two Indigo Rose the fruit of which I can't wait to see for myself. The remaining pots are cleaned and ready. Now I wait for seedlings I ordered from Lazy Ox Farm in Missouri because I just couldn't grow tomatoes without including two of my favorites, Jaune Flamme and Snow White. I Will Have Tomatoes In 2014! I can't believe how my mindset has swung 180º in less than a week. I can't believe I can look out back and see Stupice seedlings and a big pot of nasturtiums this morning when a week ago I'd all but given up on a garden. I went to the farmers' market last Saturday and as I stood at the Forty Weight Coffee table talking to Andrew, I glanced at a sign in the stall next to him. It listed the varieties of tomato seedlings they were selling including Stupice! I went back to the Thursday market and spent a good bit of time talking to Jamie (Wyllie Fox Farm) about seedlings. I came home with a flat of 18 which should be sufficient but I will be going back next week for some additional cherry tomato varieties and a striped eggplant called Listada De Gandia. Jamie expects to have some nasturtiums in a week or so but I couldn't resist a big pot of three varieties from the only vendor who had them yesterday. In an effort to avoid doing what I usually do, I'm taking a moment to finish what I started regarding cheesecake. I made a cheesecake this week but cut it up before I thought to take a photo. This is at least a fairly good image of the texture, light and perfectly dry the way I like it with a lovely touch of vanilla and lemon. McCall's Cooking School, circa 1975? I'm going through old recipe files. This one has been haunting me since I pulled it out a few weeks ago. Many years ago I think I made it twice before I found a recipe I liked better for the filling but I continued to use the Lindy's version for the crust. I have never liked a graham cracker crust for cheesecake. Who's idea was that I'd like to know. The recipe I use for the filling is one that the Family Circle test kitchen called "Our Finest Cheesecake" and is attributed to John Clancy, author of "John Clancy's Baking Book". I like it because the cake is lighter and drier than most. With electric mixer on low speed or with a wooden spoon, beat cream cheese in a large bowl until soft. Gradually beat in sugar until light and fluffy. Beat in egg yolks, one at a time, until well blended. Stir in sour cream, flour, vanilla, lemon rind, lemon juice and salt until smooth. Beat egg whites until they hold stiff peaks. 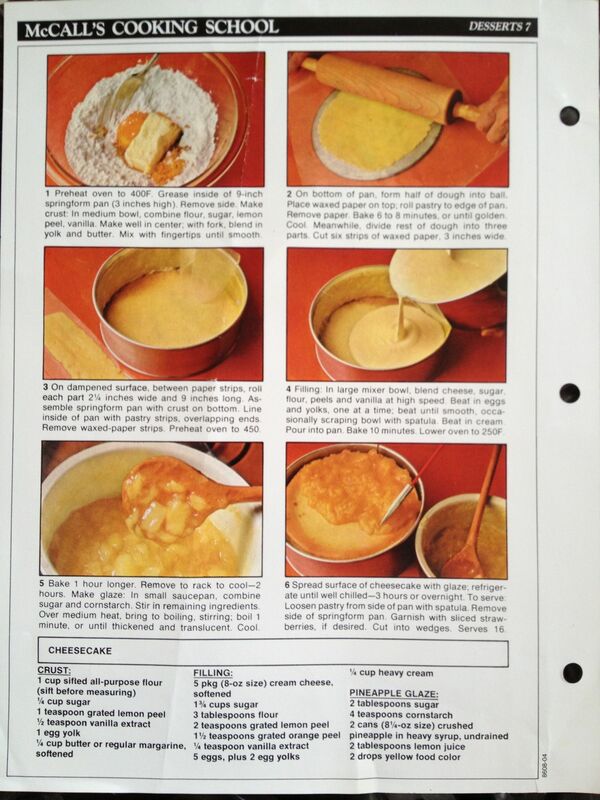 Fold whites into the cheese mixture, soufflé-fashion, until well blended. Pour into prepared pan. Bake in moderate oven (350 degrees F) 1 hour and 15 minutes, or until top is golden; turn off oven heat and allow cake to cool in oven for 1 hour and then remove it from oven to cool on a wire rack at room temperature. Chill to ripen overnight before serving. Dust with powdered sugar if desired just before cutting. There's no getting around it. I'm going to make a cheesecake. I love the snow but I've run out of room to pile it. "Uncle!!" 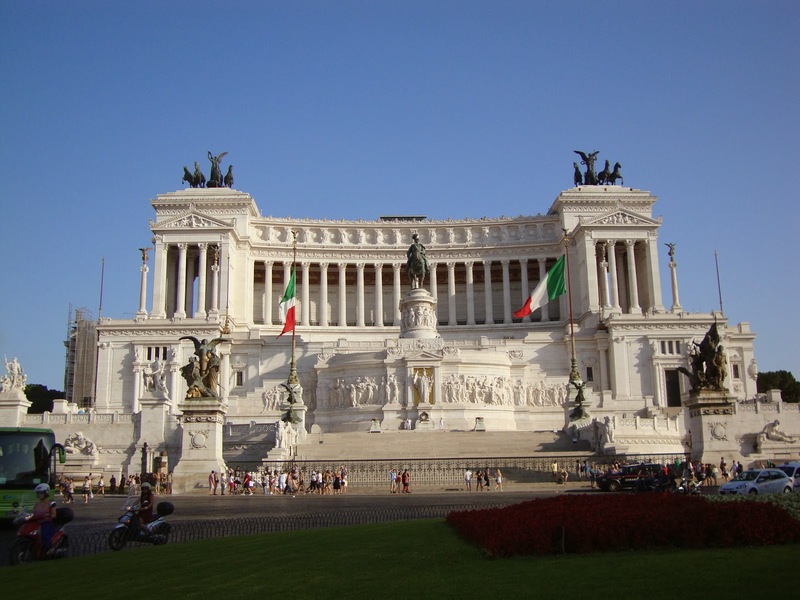 When the pile in the middle of the driveway gets this size I always wish I knew someone who could help me sculpt it into a replica of the Victor Emmanuel II Monument, Rome's 'Wedding Cake'. The fact that I'm sitting here listening to the soundtrack should be some indication of how much I enjoyed this film. I loved watching Oscar Isaac (and his beautiful complexion) but the image of NYC before the days of Trump et al was, for me, the best part of the movie. I loved the cat(s) (they used several) too and I'm not even a cat person. He was still bringin' it at 93. A good soul he was. Every once in awhile I think about coming back here but the moment usually passes quickly and I'm on to other pointless stuff. This past year however was a little less pointless. I spent it, in large part, losing some weight and, more important, regaining strength and bone density. I'm pleased with my success but even happier to be able to demonstrate to others that it's possible to get fit at 65. A year and half ago I was despondent when I put my old road bike in the attic. I simply couldn't ride more than five miles without pain and/or numbness in my hands and/or feet. Fortunately I could still ride my town bike but not on any major roadways or too far afield. Several people had suggested that I could get a hybrid bicycle that would put me more upright like my town bike and get me back on the road. I wasn't sure about spending money on a new bike but once I felt leaner and stronger I wanted to do more cycling than I could on my town bike. 2013 was, for me, the year I got Medicare and a Bianchi camaleonte tre for my birthday. I guess the best way to sum up the past year on these two acres is to say it was one of transition. The process is ongoing but at this point we are pretty much 'retired'. One of the changes we've made in the past year is the way we eat. We used to eat the conventional three meals every day but now most days we are eating a larger breakfast around 9:00 and a main meal around 2:00 with a light snack in the evening. As breakfast became more important so did the problem of a griddle. Since I gave up my favorite griddle years ago because of the Teflon coating, I hadn't been able to find a replacement I liked. I had been using a large skillet but sometimes there were tell-tale flavors from previous heavily seasoned dishes and even a hint of garlic is not something I want in my banana pancakes, thank you. A few weeks ago we made what I expect to be our last investment in high-quality cookware. We used our Christmas gifts from The Mister's father to buy a Swiss Diamond griddle. It is absolutely perfect and the first breakfast of sour buckwheat cakes was delicious as was the sourdough French toast on New Year's morning. You know you're going to outlive a lot of people who have been important in your life but I'm surprised how difficult I'm finding these mounting losses. 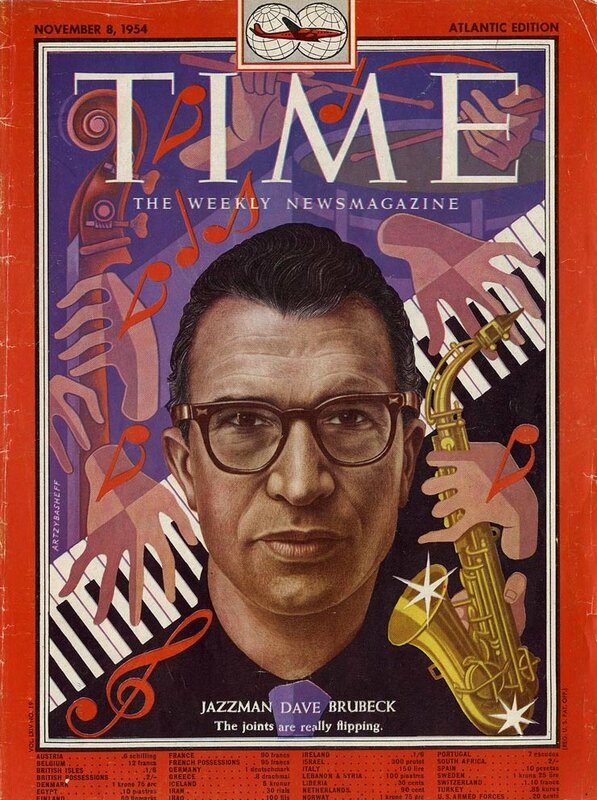 I suspect it may be that I'm less able than most to offset the losses with some measure of faith in the future but the future was a very different place when I came to appreciate the music of Dave Brubeck and Paul Desmond in the 60's. 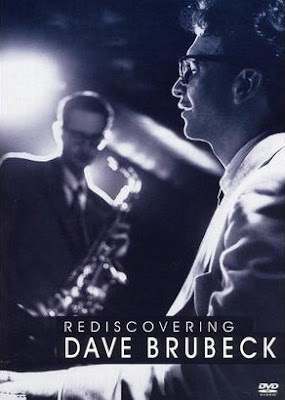 I saw Dave Brubeck in concert whenever I had the chance, the last time being here in Syracuse in 2007, but of all the concerts and recordings, the image I love best is the one portrayed in a 2001 hour-long interview with Hedrick Smith, "Rediscovering Dave Brubeck". 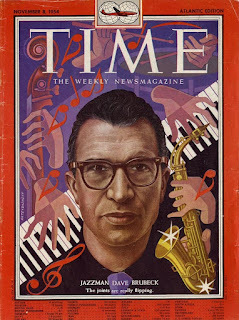 It's not often one can truly believe a famous person known from afar is also a fine human being but Dave Brubeck was just that. The attic is quiet. I'll miss the flying squirrels but not the red ones. With new coverings of hardware clothe and screening there's only the the sheet rock to replace and a couple of holes to patch. We've considered adding to the cedar trim but I haven't had any problems with moths in the woolens so I'm just going to fill a few old pillowcases with cedar shavings and place them around the room. I've spent much of the past few months hauling stuff out of the attic. The last boxes of books, crockery & glassware, linens, Christmas decorations, etc. went this week. The once cluttered and crowded attic is now almost empty and I can't for the life of me decide how I feel about that. 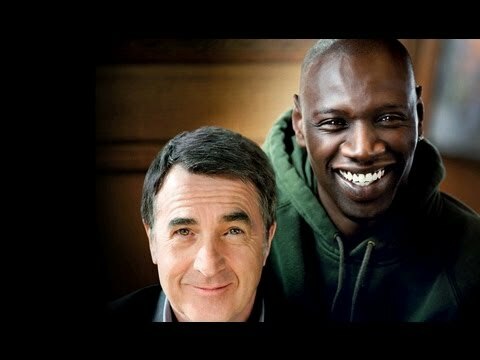 I finally got to see "The Intouchables" and while I'm not unaware of the film's flaws, I thoroughly enjoyed it because of the wonderful performances by Omar Sy and François Cluzet. A damaged corn field in central Kansas August 7, 2012. 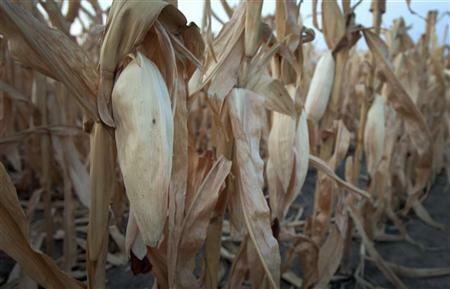 (Reuters) - Dry weather will return to the drought-stricken U.S. Midwest crop region, with corn and soybeans ending their growing season on a negative note after this week's rains proved to be too little too late, an agricultural meteorologist said Friday.